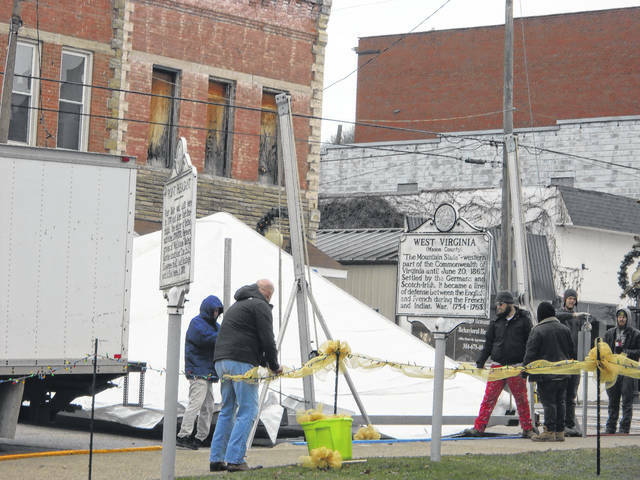 Workers begin setting up a tent on Wednesday for Friday’s Silver Bridge Memorial. At least three ceremonies will be held on Friday to observe the 50th anniversary of the Silver Bridge Collapse. OHIO VALLEY — There will be several opportunities to observe the 50th anniversary of the Silver Bridge tragedy on Friday. Starting at 11 a.m., at 6th Street, in Point Pleasant, the West Virginia Department of Transportation (WVDOT) will be hosting a remembrance event which takes place inside a large tent meant to seat hundreds and protect those gathered from the elements. The following program will be presented: Randy Damron of WVDOT will give the welcome; Mike Hall, chief of staff to Governor Jim Justice will give the invocation; the West Virginia National Guard will post the colors and deliver the National Anthem. Further remarks will be made by WVDOT Secretary Tom Smith; Gov. Justice; Acting Administrator of the Federal Highway Administration (FHWA) Brandye Hendrickson (Hendrickson will be introduced by West Virginia Division Administrator for FHWA Edward Stephen; Mason County Commissioner Tracy Doolittle and Billings will unveil a surprise for the community; the West Virginia National Guard will retire the colors; Pastor James Kelly will give the benediction. Traffic was blocked from traveling on 6th Street starting around 6 a.m. Wednesday morning so that the event tent could be erected. Traffic will still be able to travel along Main Street past 6th Street through the intersection until 6 a.m. Friday when the intersection of 6th and Main streets will then be blocked. The tent will include video screens on either side of the speaker so the audience can see what’s going on and generators will provide power to the tent meant to keep those visitors comfortable. Chairs will be provided. Additional parking is being made available at the boat landing near Krodel Park, with free shuttle service to the event site starting at 10 a.m. on Friday, and free return service offered following the event’s conclusion. If needed, some cars will be directed to the parking lot of Mason County Schools, just past Krodel Park, with the free shuttle service provided. A reception which is open to the public, will follow at 1 p.m. at the Trinity UM Church community building. Donating food and services to the event are French City Food Service, Brad Deal Catering, Heidi Sturgeon (custom cake) and Elizabeth Jones of Four Seasons Florist providing decorations. The reception is under the direction of Kenny Grady. Grady is also organizing the third annual remembrance ceremony for the victims of the Silver Bridge Disaster later in the afternoon on Friday in Point Pleasant. The program starts at 4:30 p.m. also at 6th Street. 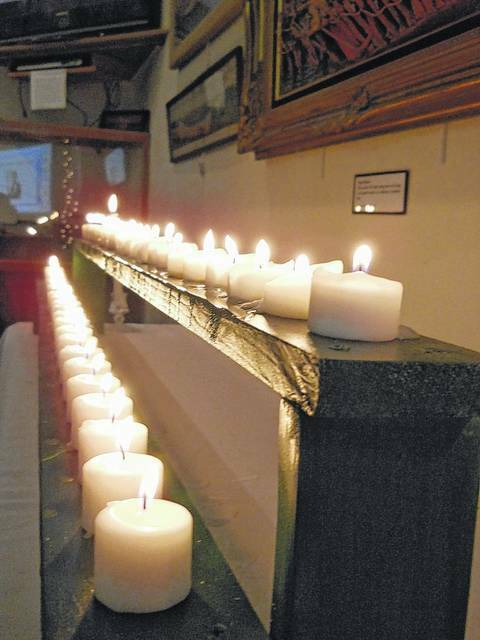 The observance will include the lighting of a Christmas tree donated by Mike and David Rawson. The tree, which is currently decorated and sitting outside the Mason County Courthouse entrance, will be lit in memory of the victims. In addition, there will be a performance by the PPHS Honor Choir and gospel group Covered By Love from Wheelerburg, Ohio. Guest speaker Rodney Holbert, an engineer out of Parkersburg, will speak about the bridge inspection regulations which came about as a result of the Silver Bridge’s collapse. Also, Mason County Commissioner Rick Handley will offer a tribute to the late Carolin Harris whose son was killed in the bridge disaster, along with the boy’s father. Harris passed away last year shortly after Christmas. She was a supporter of the bridge memorials and of downtown Point Pleasant. Grady said the name of each victim will once again be read and this year, the U.S. Coast Guard will have boats on the Ohio and West Virginia sides of the river which will shoot spotlights into the air to “crisscross” in the area where the bridge sat. In Gallipolis, State Representative Ryan Smith is set to speak at the Silver Bridge Memorial at Bossard Memorial Library. The Gallia County Convention and Visitors Bureau is teaming up with Bossard and the Gallia County Chamber of Commerce to honor the 50th anniversary of the Silver Bridge collapse. The ceremony will begin at 5:30 p.m. on Friday in the Riverside Room at Bossard, with refreshments available. Part of the memorial service in Gallipolis will be a display of written accounts of that day by anyone who has memories and can recount the events of the collapse. They will tell the different stories of people’s memories of that day from their individual perspective, with the hope of understanding how the collapse initially affected Gallia County. Also on display that day will be images from Dec. 15, 1967, of the bridge played on the projection screen in the River Room. Part of the evening will include a reading of the names of those who died in the collapse.